During tonight’s CNN debate, Gingrich supported increasing the powers of the Patriot Act. Ron Paul opposed the Patriot Act since it compromises our freedoms and privacy. What do you think? I’m personally on the side of Paul on this, how much will the United States sacrifice in terms of protection of privacy to keep us safe? The problem I see is that the United States has its fingers in so many international affairs that there are definitely threats against our nation and lots of people who resent us. Newt also has made his point on this, if ever a nuclear device was smuggled into the country it would be a disaster. Unfortunately the Patriot Act was one biggest victories of terrorists, it has drained billions of dollars through funding and reduction of productivity based on more stringent searches be them apparent or covert. In fact, who knows, maybe you are now being investigated for reading this post! Ron Paul is also the only Republican candidate that does not support water-boarding, in this Ron Paul and Senator McCain share a mutual belief. I’d rather live in a country that does not engage in torture and spying on their citizens while looking for new wars to start while borrowing the money for these wars from China, in essence selling the children of the country into economic slavery. Each and every Republican candidate except for Ron Paul is running to support the short-term well being of corporate executives – a long term plan would be more beneficial to corporations and individuals within the United States and elsewhere. No one wants to face a impending depression. In order news, B. Bernanke declared another round of quantitative easing will be underway shortly. This means in essence an injection of new money into the system where interest for this new money will be owed to the Federal Reserve by our Federal Government, where the Federal Reserve is not owned by the Government but by a collection of families who were part of banking monopolies over 100 years old. Newt Gingrich, who was probably most popular before beginning to run for president, is effectively out of the picture after being abandoned by all of his top campaign aids. Announcing his intention to run along with criticizing a Republican proposal for an cheaper alternative to Medicare put him under fire from most of the Republican party and soured his chances from the start. Afterwords, on an interview on Face the Nation he said he was “frugal” after being put on the spot for running up a $250,000 tab at Tiffany’s at one time. The leave comes after Gingrich’s recent cruise to Greece. Simply put, I believe the campaign aids lost faith in Gingrich as a leader after his ill-timed escapades and actions which made his campaign a joke. No one wants to work for a joke. Gingrich has announced he will restart his campaign soon, yet perhaps he too will realize that his aspirations are a joke. Serious contenders for the Presidency must have fervor for their cause and truly believe in what they are doing and portray themselves as honest to the American public. 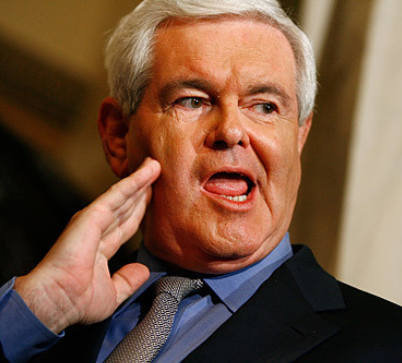 While it is theoretically possible for Gingrich to make a comeback, if bets were on I would bet heavily against it.